sarapbuhay: KICKS OF THE DAY. I havnt posted my daily footwear lately. Ill start pickn up on it. The official colorway is Vanilla/Vermillon Red-Black Frost, aside from the colors, the most the most notable feature is the speckled midsole. The red aglets on the vanilla laces is a nice touch, as is the green outline on the red swoosh, which really helps tie all the colors together on this Dunk. The insole features the silhouette of the SB mosquito cleaning up his mess with a pair of Nike SB socks. 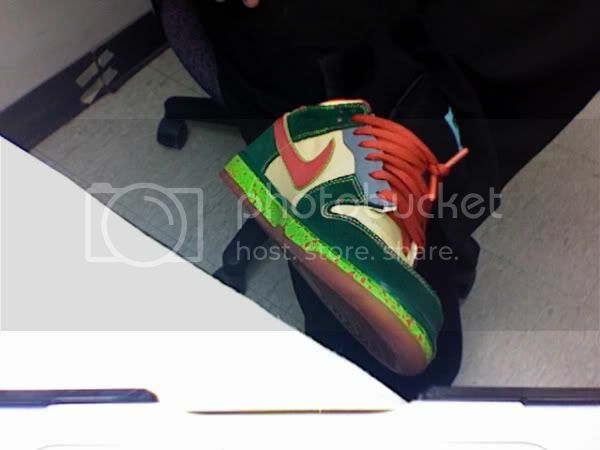 It’s nice to see some creativity like this again on the SB line because they have been leaving a lot to be desired with most releases. Mine are still in the box. Still deciding on whether to wear them or not. BTW I was reppin' HMG at the H-Town Sneaker Summit, check the NT thread for pics!